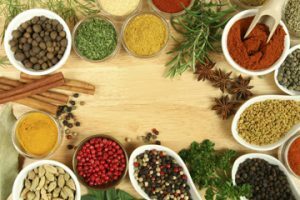 Herbs and spices have been used for hundreds of years in cooking and medicinal purposes. They add a wide range of flavors to food and may also provide health benefits. For some people, using herbs and spices can be a challenge, but it doesn’t have to be that way! It depends on the part of the plant that is used. Herbs come from the leaves of plants that do not have woody stems and grow close to the ground in mild climates. 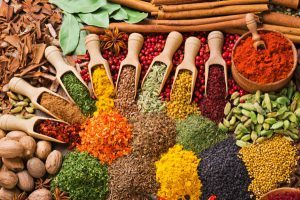 Spices are native to warm, tropical climates and are obtained from roots, flowers, seeds, or bark. Spices are used in smaller amounts because they have a more potent flavor than herbs. When used together, spices and herbs are referred to as “seasoning”. Herbs and Spices serve as flavorful alternatives to salt, fat, and sugar without adding any extra calories to meals. Instead of adding sugar to oatmeal, sweet potatoes, and desserts, try adding cinnamon and allspice. For savory meals, replace salt with black pepper, cumin and dill seed. Try flavoring foods with herbs and spices instead of using breading, gravies, and sauces. Adopting changes like these can help reduce sodium, fat, and sugar from your diet. Whether they are fresh, frozen, or dried is totally up to you and your preferences. Fresh herbs are not equal to dry in terms of the amounts that should be added to foods. A tablespoon of finely cut, fresh herb is equal to about 1 teaspoon of dried herb or 1/4-1/2 teaspoon of ground, dried her. Fresh and dried herbs must be stored differently to ensure freshness. Many should be stored in the refrigerator between 32°F and 41°F. Delicate herbs, such as basil or chives, should be added just before serving. Herbs that are less delicate, such as oregano and thyme, can be added early. Red pepper gets stronger as it is cooked, cayenne pepper should be added in smaller amounts. Always use small amounts to start when adding herbs and spices. You can always add more, but cannot take it away. When foods are going to be served cold, refrigerate for a few hours before serving to ensure the flavors of the seasoning are well absorbed. ← Boiled Peanuts Anyone? Fresh Market Peanut Info.